Born in Polis, Cyprus in 1926 Turkish-Cypriot poet-writer Yalçın completed his first education on the island. He continued his university education in Turkey where he studied Turkish language and literature. Havıng lived in Cyprus, Turkey, England and Germany Yalçın taught as lecturer at the Middle East Technical University in Ankara. During 1964 -70 he also presented literary radio programmes in Ankara. During this period he also published "Hisar" - literary magazine in Ankara. Since 1971 lives and works in Halver/Nordrhein Westphalia where he taught English until his retirement in 1986. 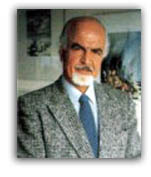 KKTC Devet Ödülü - State Prize, North Cyprus (1989). Alfred Müller rock castle Prize for Literature, Hagen (1989). Coat of Arms sign of the city Halver. Since 1977 member in the Writers Association of Ruhr Mark and of the Artists' & Writers' Association of North Cyprus. "A" Sokagi/"A "road , poems (1969, Hisar publishing house). EN Eski EN Uzark (1988, Önel Verlag). Daha Yeni Daha Yakin (1991, Önel Verlag). The sun and the man , poems (1977, Hisar-Verlag/1997, Hague + Herchen).